Welcome my friends. I’m so glad you joined me for another week. Life has been hectic lately, but things are slowing back to normal now. We recently talked about lavender. I talked about the scientific side of it, the history, the modern age “discovery” of the property of lavender & finally the uses of it. In my research, I learned more than I could put in one writing so, I decided “Lavender” will have a “Pt. 2”. In this one we will learn about the 3 different kinds of Lavender Oils & some of my personal experiences using this oil. As I mentioned there are 3 types of Lavender Essential Oils. What they have in common is they each belong to the botanical family of Lamiacea & each have the Latin “Lavandula” in their name, but they do have different properties. Naturally occurring in nature is True Lavender & Spike Lavender. Lavandin is a hybrid of the True & Spike, created in the 1920’s. Naturally we can expect Lavandin to share properties from both, so let’s look at each of them first. 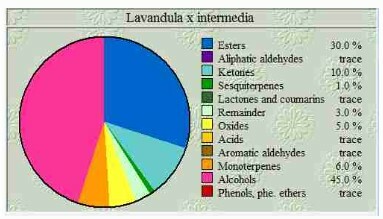 True & Spike Lavenders have the same basic makeup of 12 chemicals. The difference is in the percentage of each chemical. The ones we’ll touch on are Esters, Alcohols, Oxides & Ketones. These four are the biggest players. Alcohols bring with them properties like antifungal, antiviral, strong bactericidal, balancing, anti-inflammatory & immune-stimulant. In the Essential Oil the alcohol rarely causes skin irritation. Oxides are usually irritating when applied to the skin, particularly on young children & people with sensitive skin. Oxides aid in respiratory illnesses. They are antiviral, antifungal, and antibacterial, with expectorant effects. Ketones assist in the flow of mucus & will ease congestion. They promote wound healing & aid in the formation of scar tissue. Ketones are usually very toxic, but there are some (lavender, jasmine, peppermint, etc.) non-toxic ones. True Lavender is made up of about 45% Esters & 36% Alcohol. This would make it best for balancing, calming, cell regenerating. anti-inflammatory in the beginning of the infection, antifungal, antiviral, a strong bactericidal & an immune-stimulant. Spike Lavender is about 34% Oxides, 32% Alcohols & 15% Ketones. This combination makes it more antiviral, decongestant, mucolytic, immune stimulating & other stimulating properties. In the Spike the Esters are down to 2%, making the Spike less in antifungal, antiviral & bactericidal properties. 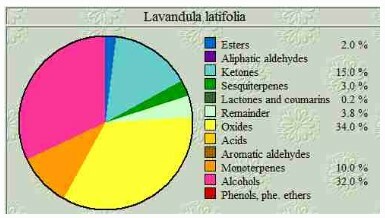 That brings us to the Lavandin Essential Oil. As a hybrid, we can expect it to have a bit of both Spike and True Lavenders. What it appears to be is the highest in the Alcohol (45%) & Esters (30%) making it the strongest antifungal, antiviral, bactericidal, immune-stimulant & balancing oil. 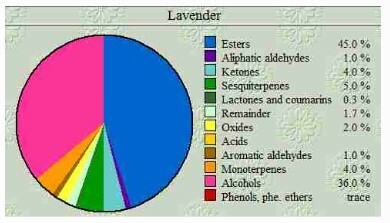 There are the three types of Lavender. I happen to be using the Spike Lavender now. I diffuse some in the evenings after work. I have found it helpful in letting go of the day & unwinding before my yoga/meditation. I pray this has been as informative for you as it has been for me. If you wish to purchase the Spike I do have it in the Organic at http://www.lbelitearomas.com/. Til next we meet, may you Be Blessed.